We investigate the sensitivity of simulations of the last glacial inception (LGI) with respect to initial (size of the Greenland ice sheet) and surface (state of ocean/vegetation) conditions and two different CO2 reconstructions. Utilizing the CLIMBER-2 Earth system model, we obtain the following results: (a) ice-sheet expansion in North America at the end of the Eemian can be reduced or even completely suppressed when pre-industrial or Eemian ocean/vegetation is prescribed. (b) A warmer surrounding ocean and, in particular, a large Laurentide ice sheet reduce the size of the Greenland ice sheet before and during the LGI. (c) A changing ocean contributes much stronger to the expansion of the Laurentide ice sheet when we apply the CO2 reconstruction according to Barnola et al. (Nature 329:408–414, 1987) instead of Petit et al. (Nature 399:429–436, 1999). 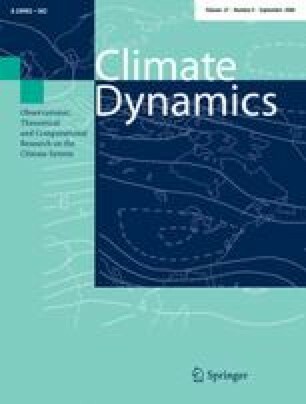 (d) In the fully coupled model, the CO2 reconstruction used has only a small impact on the simulated ice sheets but it does impact the course of the climatic variables. (e) For the Greenland ice sheet, two equilibrium states exist under the insolation and CO2 forcing at 128,000 years before present (128 kyear BP); the one with an ice sheet reduced by about one quarter as compared to its simulated pre-industrial size and the other with nearly no inland ice in Greenland. (f) Even the extreme assumption of no ice sheet in Greenland at the beginning of our transient simulations does not alter the simulated expansion of northern hemispheric ice sheets at the LGI. We are grateful to Ralf Greve for providing us with the ice-sheet model SICOPOLIS. The authors would like to thank Alexandra Jahn for technical assistance. The work was funded by a subcontract to project 01LD0041 (DEKLIM-EEM) of the Bundesministerium für Bildung und Forschung (BMBF) and it was partly funded by the Deutsche Forschungsgemeinschaft (DFG) project CL 178/2-1.